Do people buy fake engagement rings to travel abroad? We have been asked many times over the years to create replica engagement rings based on our existing jewellery designs. But why would anyone want a travel engagement ring? The answer varies depending on personal circumstance. Some of our clients who purchase a very expensive engagement ring worry about carrying it abroad. In addition to the risk of loss, in many countries, there is an increased risk of robbery. Furthermore, jewellery insurance policies may not cover an item’s value abroad. Some areas of the World pose increased risks during travel. Besides leisure, many clients are committed to working trips abroad. 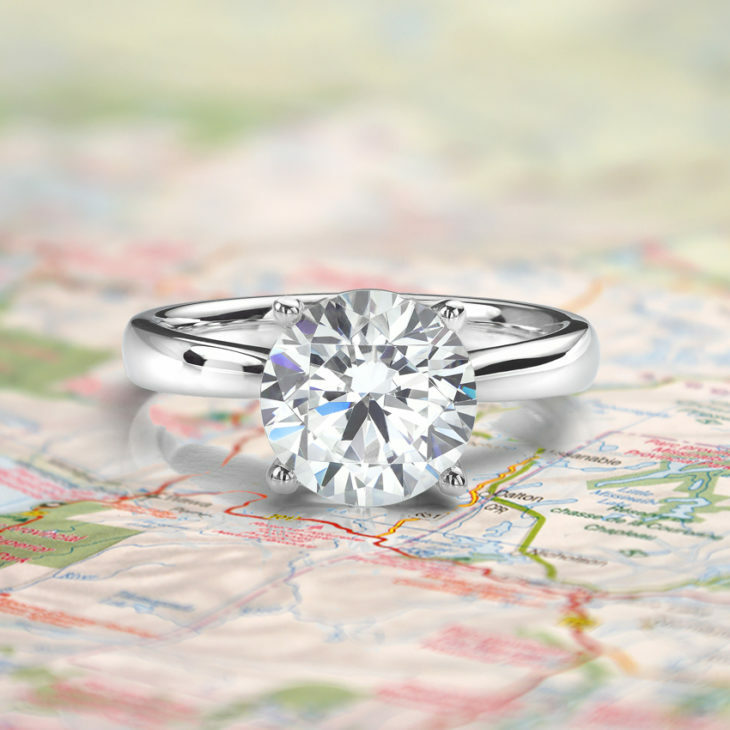 Naturally, some would prefer to wear their engagement ring whilst travelling. In addition to our diamond options, we now offer a replica option set into precious metal. Since the majority of the cost lies within the diamond itself, it is possible to achieve a very close replica ring. The Lila engagement ring, just one design available as a diamond ring, Swarovski Crystal set ring or as a finished ring mount. Do replica engagement rings look real? Anyone who visits our UK showroom will see that many of our ring designs are carried in our showroom as replica rings. Designs are then crafted in the precious metal required and set with natural certified diamonds. Our showroom samples are typically set with brilliantly cut Swarovski Crystals. We are proud that our solution provides the best possible alternative to an actual diamond ring. At this point, you might be wondering why people don’t just buy a ‘replica’ instead of the actual diamond engagement ring. 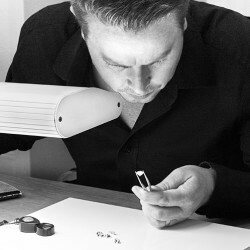 There are two main reasons for choosing a diamond above any other alternative replica stones. For long-term wear, diamonds are extremely durable. A ‘fake’ or replica ring, when worn daily, will wear. The polish will scuff and facets will appear worn under a lens. For this reason, replica rings should really be worn occasionally, with the real diamond engagement ring worn day-to-day. What makes our replica diamond engagement rings the best? The replica option for our engagement rings results in the best possible replica rings. This is because we only use precious metals—just like our real engagement rings. Furthermore, we use only the very best Swarovski Crystals, which are diamond cut to perfection and brilliantly faceted. Please note that for any order we receive for a Swarovski Crystal, replica engagement ring design, the item is fully tracked and separated from all diamond orders. In addition, all invoices show the Swarovski option clearly noted in the product description received by our clients.